If you are looking for an effective way to ease your back pain and improve your overall wellbeing at the same time, you should consider inversion table therapy. It’s a treatment practiced even in the old times, where your body is inverted upside down for a few minutes. Well, from an upside-down position, the body becomes totally relaxed. Your spine is decompressed, and your blood circulation is stimulated. Gravity puts a big strain on the human body, as it brings constant pressure on the entire body all the time – whether you are in an upright, sitting or even lying position. In fact, the only time the body is completely decompressed is when it is inverted upside down. Therefore, inversion table therapy is a great way to rehabilitate chronic back pains. It is an ideal treatment for people who suffer from health issues like sciatica, posture problems, and osteoarthritis. Not only that, inversion is also a worthwhile routine for anyone looking to enhance his or her health and fitness. You can also check out our other top inversion table picks. Purchasing an inversion table means reviewing all the options in the market. And that can be confusing and time-consuming for some, with all the brands and models available. If you are really considering getting an inversion table, you should know the best that’s out there. And Health Mark is one company to consider because of their top-quality products. Much like Ironman and their Gravity 4000 inversion table the Health Mark Pro Max is a very well know table. Health Mark is a trusted brand that manufactures high-quality therapeutic equipment. Originally designing tools for professional therapy businesses, they are now marketing inversion tables for household consumers that aim to achieve pro-level treatment right within their home. The brand showcases one of the most innovative inversion tables right now: the Health Mark Promax Inversion Table. The Health Mark Promax Inversion Table has a one-of-a-kind design that allows two main positions when inverting. This means that it can work on either the usual face-up position or the inverted face-down position. The face-down feature is fantastic because you can combine inversion treatment with a soothing back massage by a therapist afterwards. This inversion table is initially marketed to businesses and therapy centers but is now available for home use. 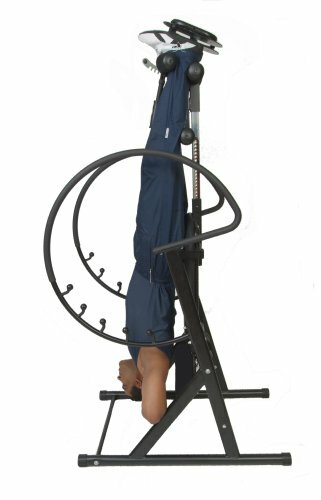 What’s great about this inversion table is that you can get professional-level treatment without the fuss of going to a therapist. While traditional inversion tables only allow users to lay face-up, the Health Mark Promax Inversion Table provides something extra with its face-down option. With this model, you can add movements and stretches that are otherwise impossible on other inversion tables. The Promax inversion table has full-arc handles made of tubular steel that help support your grip and movements. This table rotates a complete 180 degrees, and it has a total of 6 pre-set angles you can lock into depending on your preference or level of fitness. Angling becomes easier because you can set it prior to lying on the table. Still, you can change positions while you’re already inverting, because the angle controller is very easy to use. Padded ankle supports on the front and rear portions of your feet enable a secure but comfortable locking in both face-up and face-down positions. These, along with thigh and knee padded supports, are specially positioned so that you get the most protection while inverting. Plus, these cushions are perfect for users who may have trouble bending over. The anti-slip feet feature built into the Promax inversion table makes it very secure so that you can comfortably use the unit without any assistance. One key advantage with this model is that you have added movements and stretching positions. For instance, you can do the chest raise hyperextension, called the cobra pose. This is where you lift your chest away from the backrest and hold your hands at the back of your head. You get a more intense stretch with this pose. To make you comfortable during face-down positions, there’s a crescent-shaped head rest (like massage beds) on one end of the table. This prevents neck strain during the face-down position and allows a streamlined lying position. It’s also adjustable and removable depending on what you prefer. All the stretching movements and exercises are proven to improve spine health and posture, increase blood circulation, and stimulate vital organs for better functioning and strengthen immunity. And the benefits don’t end there. After a nice inversion session, the Promax inversion table is particularly useful if you have a masseuse or therapist, who can give a rejuvenating massage while you lie on the table. With the Health Mark Promax Inversion Table, you can reduce stress and decompress in the comfort of your home. What’s unique with the Health Mark Promax Inversion Table is it can support weight up to 600 lbs! This is about twice the typical weight limit of other inversion table units. The steel base, combined with the sturdy curved handles and the complete anti-slip feet roller supports and ankle brackets, make it very easy to invert on your own. This inversion table is perfect for larger users, because it can handle heavy weight than other inversion tables. Those who are overweight and/or suffering from obesity can finally perform inversion and improve their blood circulation and overall health functions. This model measures 28” W x 58” H x 45” D and has over 25 height settings to accommodate people of up to 6’6” in height. If you’re planning to have this device indoors, it’s recommended that your ceiling should be around 7’ so you can invert safely. The device weighs 96 lbs, a bit heavy compared to other models, but this gives the stability needed for inversion. Assembly of this inversion table is relatively easy and usually takes about 2 hours. The package includes parts and tools needed plus the instruction manual. The downside to this model is it’s not foldable. It cannot be stored away when not in use, so you have to place it somewhere spacious dedicated solely for your inversion sessions. This model is covered by a 1-year warranty for the frame; however this inversion table is built from high quality materials and there are no complaints of breakdowns even though the warranty is relatively short. 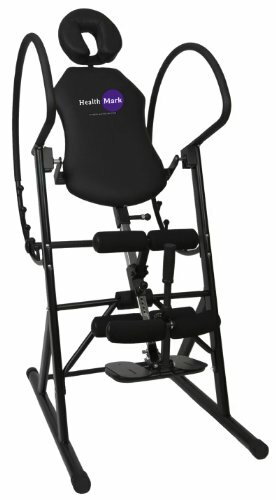 What is the weight capacity of this inversion table? It can securely support up to 600 lbs of weight. What is the minimum and maximum height it accommodates? The Health Mark Promax Inversion Table has 25 height settings that range from 4’10” up to 6’6”. What is the minimum ceiling height required? Whatever the user’s height, it would be best if you place this inversion table at a high-ceilinged room, about 7 feet high. That should give enough space for a full 180-degree inversion even for taller users. Remember, this model can accommodate up to a 6’6” person, so it’s best if your physical space can allow it. How are the feet secured? 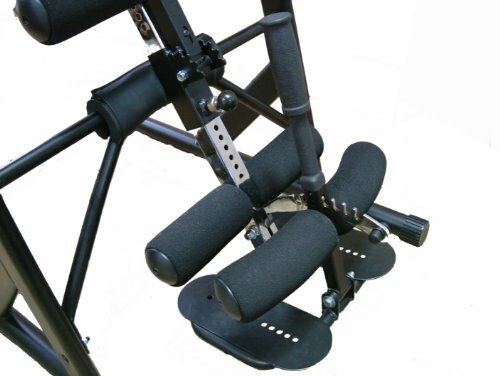 This inversion table has an anti-slip feet system where built-in gear lock supports both ankles. The front and rear of your ankles are secured comfortably during every movement. In addition, thigh and knee supports are also included to add stability during inversion. These are positioned perfectly to reduce strain on the feet while inverting and allow a comfortable session each time. The Health Mark Promax Inversion Table is one great piece of equipment where you can do inversion and so much more. It has preset angles that allow different core exercises. Plus, it has a face-down option that adds hyperextension of the spine that gives you another dimension to your inversion. It can even double as a massage table, the only inversion table of its kind that does so. That’s a whole lot of value for a single purchase. Health Mark inversion table reviews generally speak about the high-quality workmanship and materials used for their products, and the Promax is no exception. Although it is quite pricey at around $700, you do get a lot for your investment. Think about it: how much would you incur from chiropractor and doctor treatments, medication, and, not to mention, massages? That would surely be very expensive in the long term. If you compare that potential cost with the one-off cost of this inversion table, then you might realize that this might actually be the better deal. Get Health Mark Pro Max today and help ease your back problems away. 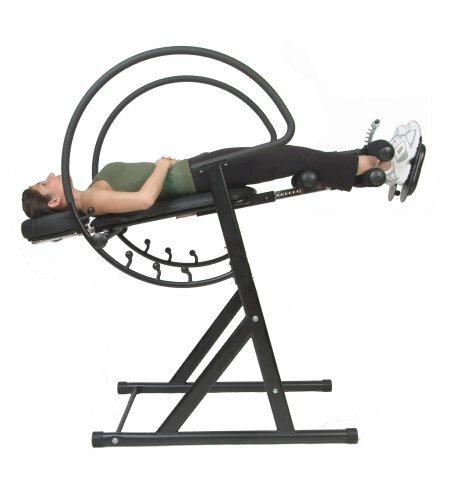 With this premier inversion table, stretching and strengthening your body has never been as exciting. It’s well made, one-of-a-kind, and strong enough to handle heavier users of up to 600 lbs. This is definitely one of the best inversion tables available right now.